We’ve learned a lot from our fails. These four taught us some of our hardest lessons. 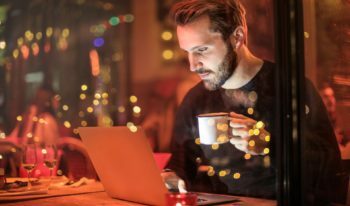 In millions of unique visits to this blog, we’ve learned a thing or two about how to drive traffic through content. And with the blog being—by a huge margin—our biggest source of new customers, we’ve learned a bit about converting blog traffic, too. We’ve done some stuff right, and a lot of stuff wrong (especially in the beginning). I can point to four big mistakes that have cost us dearly. Had we avoided them, by my count (using the performance improvements we’ve seen after correcting those mistakes), our blog would be at least triple its current size, and would have resulted in hundreds of thousands more signups and millions more in revenue by now. I hope that by sharing the biggest mistakes we made early on, I can help you avoid the fails and start reaping these same benefits. Your blog posts aren’t sales pitches. And that’s a good thing, because your posts should be free, high-value resources that will help readers solve their problems before they buy. But as a business, you need to grow. And if you’re not leveraging your blog for growth, then it’s not an asset to your business. Now, that doesn’t mean you have to write posts to pitch your readers; we never have. But until a few months ago, we made very little effort to turn readers into customers. And that was a mistake. How do I know? Because as soon as we started to deliberately and directly offer Groove to blog subscribers, we started getting significantly more signups. In the past, when a reader signed up for our email list, they’d get an email welcoming them to the list, and that was it. No pitch. 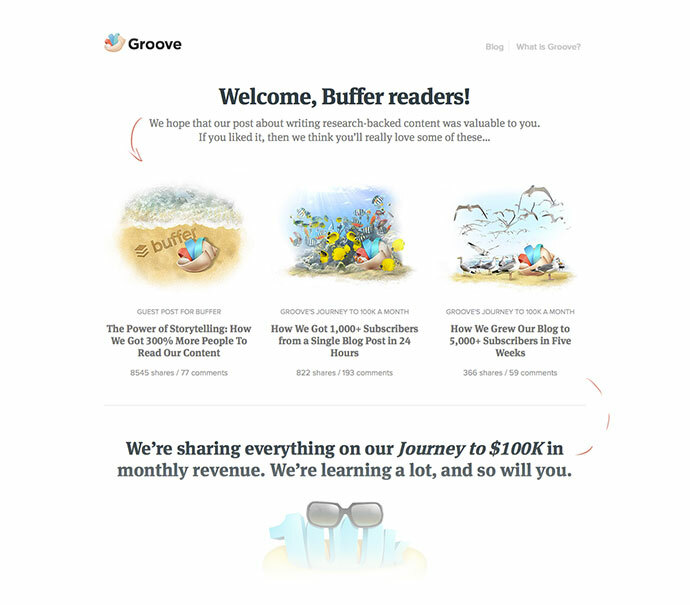 It’s highly targeted: it thanks the reader for enjoying our blog, shares similar content to what they just read to get them more engaged with our blog, explains what Groove is, and offers them a special extended trial that isn’t available on our main site. We’ve started to use the same approach for our guest blogging, too. Before, readers who clicked on links to Groove in our guest posts would be taken to our homepage. 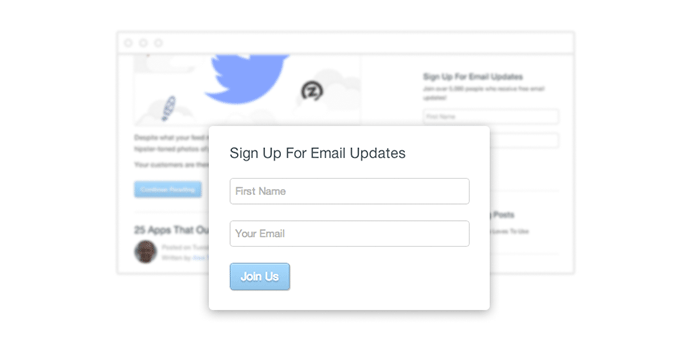 Now, we send them to a targeted landing page, customized for each guest blog. For example, when we wrote a guest post on the Buffer blog, rather than sending readers to our homepage, we built a custom offer page for Buffer readers. 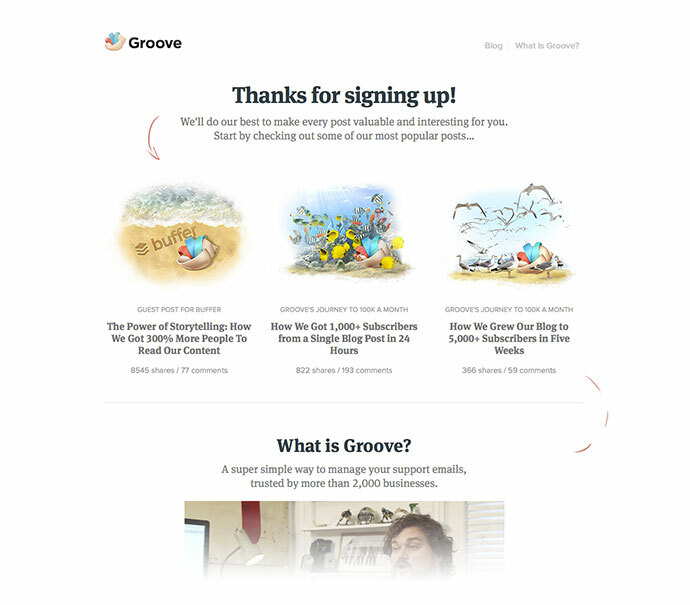 Of the traffic that reached that page, more than 15% of them signed up for an extended free trial of Groove. Depending on where our content appears, this landing page converts anywhere from 5 to nearly 20 percent of visitors into Groove free trial users. When we first started blogging—well before the Groove blog was in its current iteration—we did just that: we blogged. We wrote post after post, and kept getting frustrated that we weren’t getting any traffic or shares. 95% of our time spent on the blog was on writing. The other 5% was spent on some scattered Tweets and emails to try and get the content in front of others. As we later learned, that was a huge mistake. When we finally launched the Journey to $100K blog, we did a ton of research on content marketing and studied how other companies leveraged blogs for traffic and conversions. One of the most surprising lessons was just how much more to successful blogging there was than, well, blogging. The most successful content marketers I talked to all said the same thing: spend at least as much time promoting your content as you do writing it. To learn how we promoted our content, check out the details (including scripts) that we published in our influencer engagement plan. In short, we spent many hours doing research and compiling a list of the influencers that we thought our target audience would follow. Then we spent time building relationships with those influencers; becoming active in their blog comment sections (not with link spam, but with genuine, high-value discussion) and sending them to-be-released drafts of our blog posts for feedback. 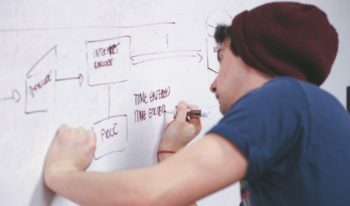 The notes we got were invaluable and helped us make huge improvements to the content. Just as importantly, when we published the posts, the people who helped us improve them were more than happy to share them with the world. Our outreach ended up leading to the blog getting more than 1,000 subscribers within 24 hours, and more than 5,000 after the first week; a big change from our previous flops. If you’re not making it ridiculously easy for people to subscribe to your email list (and you do have an email list, right? ), you’re cheating yourself of loyal, long-term readers. Soon after I got that email, we put a prominent sign-up form at the end of every post with a direct call to action that made it clear why the reader should sign up. That form replaced our old, boring sidebar form. The result? 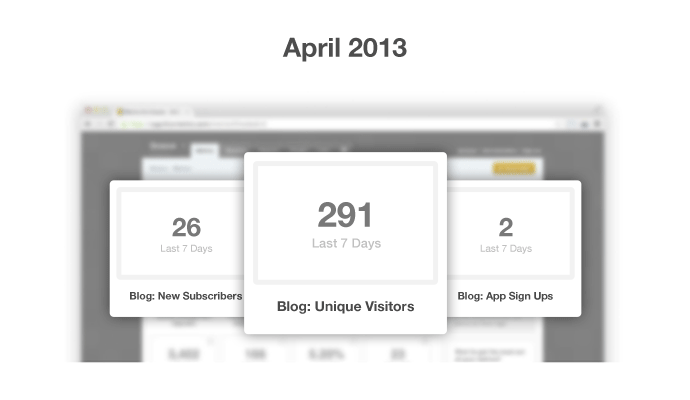 The new form nearly tripled our signup rate overnight. 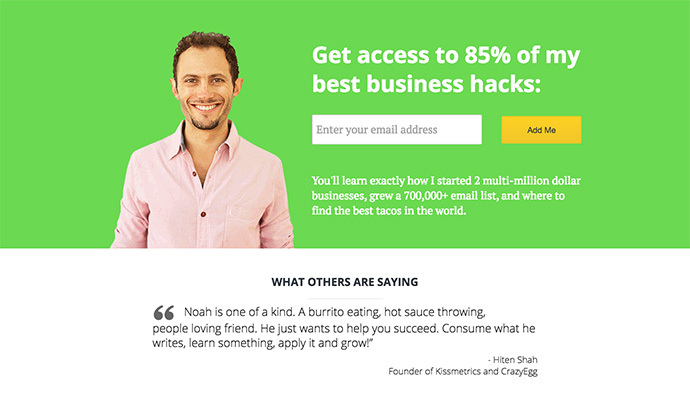 Noah Kagan, founder of AppSumo, set out to try and capture more email subscribers to his site, OkDork. 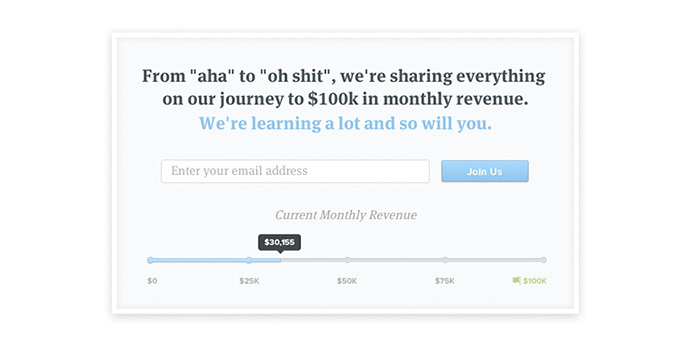 The change that made the biggest impact on signup conversion rates? His conversation rate went from 3% to around 5%, nearly doubling with one simple change. This is an area where we’re continuing to improve, but even the small changes we’ve made have led to big impact. Are your readers hearing from you regularly? If not, there’s a good chance they’re forgetting about you. 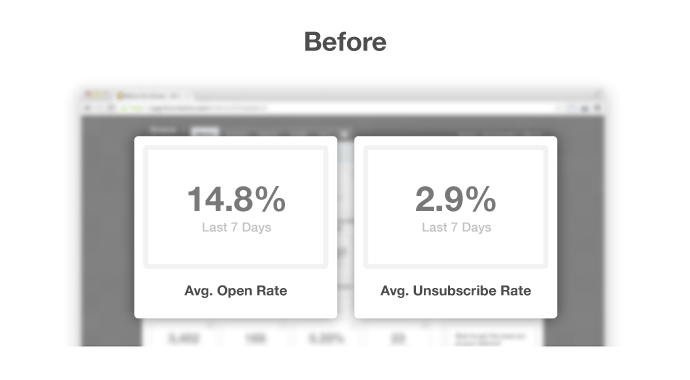 A year ago, when we posted once every two-to-three weeks, our open rates were low (averaging around 15%) and our unsubscribe rate was higher (around 3%) than it should’ve been. When we started posting and emailing weekly, both stats improved significantly; open rates more than tripled to nearly 50%, and unsubscribes are down to under 1%. Becoming a regular presence in your readers’ lives keeps them engaged and eager to read your content. Being erratic and disappearing from their inboxes for weeks at a time makes your email just another annoyance they didn’t expect. Unfortunately, as far as I can tell, there’s no single best answer here. Derek Halpern says a few times a month is fine. 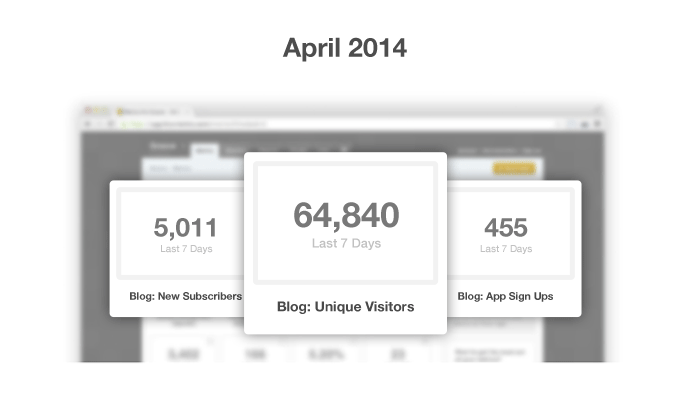 Neil Patel, on the other hand, writes 8 blog posts a week (I’m exhausted just typing that). But whatever rhythm you find works best for you—and really, the best way to know this is to test what works for your unique audience— make sure your readers get used to hearing from you regularly. They’ll learn to expect your emails and posts, and you’ll get the benefit of having a loyal, engaged audience. Just like anything in business, blogging is a learned skill. 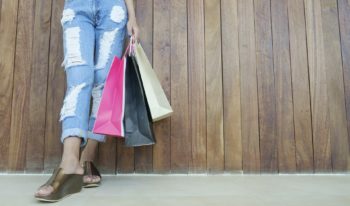 Even “successful” bloggers make mistakes. At Groove, we still screw up all the time, and not every post is a hit. But we learn from our mistakes, we move on, and we do better next time. It takes effort, practice and a whole lot of mistakes to get things right and start turning your blog into a serious driver of new customers. But hopefully, by reading this and doing a checkup of your own blog to correct any of these mistakes that you’re making, you can avoid a painful part of the learning process. A different version of this post first appeared as a guest post on the Unbounce blog.